Evan Lysacek did not feel well enough to compete in the Marshall's Figure Skating Challenge in early April, finishing fifth in a strong field. Disappointment has dogged promising American skater Evan Lysacek at the World Junior Figure Skating Championships. Three times he’s skated well enough to win and three times he’s been second. “My big goal since 2001 was to win Junior Worlds, but it wasn’t meant to be,” he said. To make matters worse at his last Junior Worlds in The Hague this March, Lysacek wasn’t able to warm up properly in practice for the exhibition and tore a groin muscle, reducing his training time. He did not feel well enough to compete in the Marshall’s Figure Skating Challenge in early April, finishing fifth in a strong field. “I also felt I had lost track of my goals after Nationals,” he stated. “I took skating for granted and wasn’t working hard enough to move to the next level.” That led him to take some motivational seminars to change his outlook. “I wrote my own mission and adopted one of their premises – if you don’t change something every ten minutes, you won’t meet your goals in a year.” That led him to change his lifestyle, emphasizing skating over everything else, improving his diet, getting more sleep, and partying less. He even has a screen name to remind him of his purpose. The approach has worked well. For the last two years, Lysacek has done well at both junior and senior events. In 2002-2003, he won the Triglav Trophy in seniors and finished second at the Junior Grand Prix events in Courchevel and Montreal before finishing fifth at the JGP Final. He was seventh at the U. S. Nationals in senior men and tenth at Four Continents. “My goals were to finish in the top ten at Nationals, qualify for the Junior Grand Prix Final and improve my placement there, win Sectionals for the first time, have a triple Axel, and qualify for Junior Worlds, all of which I accomplished,” he said. Last season, he won the Junior Grand Prix Final, the SBC Cup in Japan and the Croatia Cup in Zagreb. He took a bronze medal at the Four Continents Championships, and finished fifth at U. S. Nationals. And that was after having surgery on his foot during the summer. The 18-year-old currently trains in California with Frank Carroll and Ken Congemi, with whom he has worked since June 2003. He usually skates for an average of three hours a day, six days a week and does about 5-6 hours of off ice training each week. 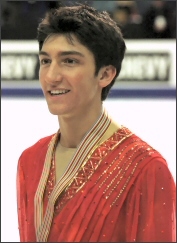 For the previous two years, Lysacek had worked with coaches Viktor Kudriatsev and Maria Jezak-Athey in Chicago. “I think Russian skaters have more artistry and better technique, while American skaters have more stamina and consistency,” he said. “I felt that a blend of the two methods would work for me so I went to the best Russian technician. But last season, Viktor had to stay in Russia. He said I could come but I wanted to stay in the U.S. He recommended that I work with Frank.” In past summers, Lysacek has often worked with Kudriatsev as he conducted clinics in other countries, including Russia, Germany, Switzerland and the Czech Republic. His free skate was new for 2003-2004. For the previous season, he had used music from the Drop Zone soundtrack for the free. “Oleg Epstein found the long program music for me. He thought it suited my style. It was a challenge but the music was really comfortable for me. It’s kind of unusual music that sparked some interest in the audience. The judges didn’t like it, so I picked Rachmaninov’s Piano Concerto No. 2 for this season.” Lysacek also has three exhibition programs which he uses depending on his mood. They include Time to Say Goodbye, Sting’s Desert Rose, and Enrique Iglesias’ Hero. Epstein choreographs all his programs. To relax, Lysacek listens to music, hangs out with non-skating friends, and goes to the mall and to the movies. He enjoys suspenseful movies and alternative and rock music. He’s also learning to play golf, a sport that his older sister also plays. He collects model cars and gives most of his stuffed animals to friends and charities, although he keeps some special ones at home. For next season, Lysacek hopes to do some senior Grand Prixs. “I just want to go out and improve on my best,” he said. “I don’t have any expectations on placements. I want to have strong showings and make a good first impression.” Lysacek hopes to compete at the Olympics in 2006 and medal in 2010. Then he would like to skate professionally. He doesn’t plan to coach. “I want to go to the Harvard Business School and study international business, he said. “I’ve been to the Jimmy Fund show several times and really like the atmosphere at Harvard.” Lysacek has graduated from Neuqua Valley High School, where he was taking advanced placement classes, but took off last year because his move to California left him no time to apply to California colleges. He plans to start courses in the fall.